A letter to parents from Mark Morrell, Ph.D., Principal of Bridgewater-Raritan High School (BRHS) located at 600 Garretson Road in Bridgewater, New Jersey, clearly states the school’s stand on the March 14th demonstration, regarding his school, which is quite different from the letter released by Bethel High School Principal Mr. Christopher Troetti recently. 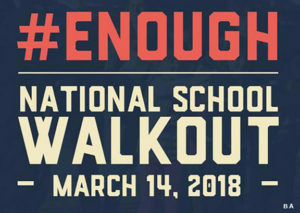 Notably, the letter is addressed to “Parents” and not “Students and Parents/Guardians,” and it advises parents to be the final judge on whether or not their child participates in the March 14th national movement to have students walk out of class while school is in session. “We will leave to you, the parents of our BRHS students, to communicate judgement on the values and merits of such a political action,” the letter reads. Merrill’s letter also clearly states school discipline rules, as originally stated in the student handbook, that will be enforced if the students choose to participate in the demonstration this Wednesday or in future protests. Merrill also reflects an issue we have been witnessing in social media chat lately, mainly, that if you allow this demonstration, where then do you draw the line in future ones? “If we allow students to demonstrate during instructional time for one cause, it could become a precedent for future student actions,” the Merrill letter reads. The latest school shooting in Florida has become a catalyst for student action. Students around the country have walked out of classrooms to support school safety and stricter laws. There has been a national movement to have students walk out of class in support of these principles on March 14. I have been asked by students and parents to support the walkout and I have been asked by students and parents not to support the walkout. The dilemma is how to support those students wishing to express their opinions and likewise students who choose not to participate. Walking out of class does not promote school safety. In fact, it could do just the opposite–It will put students at risk. There will be no audience for students other than themselves. We encourage students to form clubs with similar minded students which can focus on positive change. There can be any number of future events for which students also have strong feelings and wish to walkout of class. If we allow students to demonstrate during instructional time for one cause, it could become a precedent for future student actions. We cannot make judgements about whether we agree with a cause (such as gun control which is part of this national movement). We have a responsibility to be fair, consistent, and respectful of all political viewpoints. Meetings with student leadership expressed the difficulties of such a walkout. We offered to provide time during each student’s lunch period to express their views in a manner that would not interfere with instructional time. Ultimately, student leadership decided that it was important to stand with the national movement. We have coordinated with the Bridgewater Police department to bring in extra officers onto campus on March 14. Parents and members of the public will not be allowed in this area and trespassing will not be tolerated. Teachers have been instructed to remain in their classrooms and to continue with instruction for remaining students. Walkout participants will receive no credit for any work missed including tests, quizzes, and other class work. In addition, students who miss more than half the class (20 minutes) will be assigned a cut of class as discussed in the student handbook. While this will be the procedure in this instance, any future walkout will be immediately met with assignment of a Saturday detention or a day of In-school suspension, a cut of class assigned, a zero for all class work, and an absence towards the attendance policy. In 2008, just such a series of events unfolded to protest educational funding and we assigned every participant in the walkout detention. 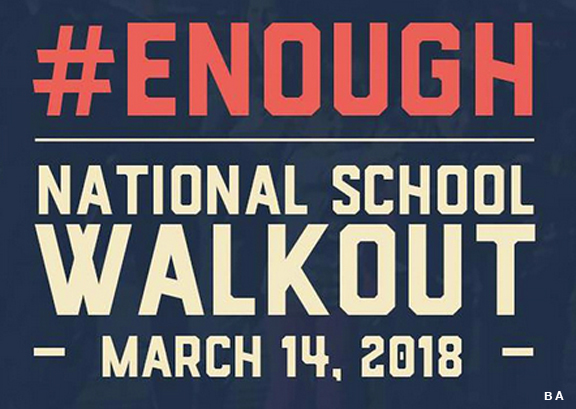 I suspect there will be additional walkouts in some schools across the nation and we will take a hard line against any additional actions that disrupt the orderly operation of our school. These are challenging times. These recent events make all of us feel vulnerable in public places–but these matters are best discussed with classroom teachers, counselors, and through communication with legislators. We as a school community are all concerned with school safety. We welcome respectful dialogue to that end. The school has not endorsed this walkout, however we do respect students for standing up for their beliefs. We also respect the rights of those students who choose not to participate as well. We will leave to you, the parents of our BRHS students, to communicate judgement on the values and merits of such a political action.